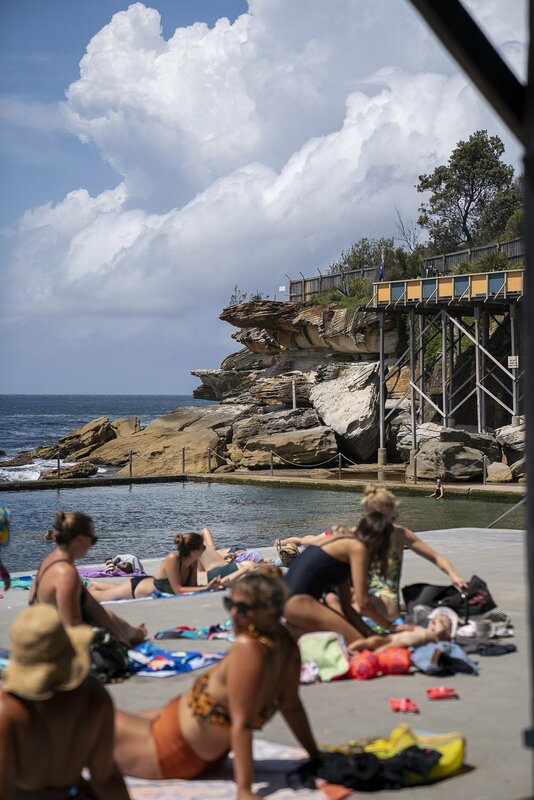 There is no better place to be reminded of the ocean’s power to overwhelm, transform and delight than Coogee’s magical, slightly madcap Wylie’s Baths, say Places We Swim’s Dillon Seitchik-Reardon and Caroline Clements, in their first column for Local East. Wylie’s Baths is not a secret spot by any stretch of the imagination, although it is easy to miss. You can’t help but feel you’re sneaking into a secluded private residence as you venture off the South Coogee footpath, half expecting to be shooed away by the likes of Gina Rinehart or James Packer as you head down a flight of stairs towards the ocean. It’s not until you click through the turnstile and land on the sprawling timber deck that Wylie’s finally reveals itselfWylie’s opened in 1907, making it one of the oldest ocean pools in the country, yet it has somehow withstood the test of time and erosion. If there is any place that best represents our Sydney swimming culture, it is this well-worn monument to leisure. There is an element of theatre here that you don’t find anywhere else in the world. The deck hugs the cliff like a grandstand, sending a clear message to all that the ocean should be the source of our entertainment. A hundred spindly legs elevate the east-facing vantage point of Wiley’s deck, which also bends around to the south to create protection while also providing a place to seek shade down below. Locals are quick to claim the most prized positions: shaded nooks beneath the stairs or else a sunny length of sandstone slab just big enough to fit one. You will often see the same people, arranged in exactly the same way. You can imagine them settling into “their” rock, a bit like unlocking a phone with your fingerprint. Matthew Martin is one of these locals, a cartoonist who shifted his saltwater addiction as a surfer to lap swimming in this ocean pool. He’s been coming to Wylie’s almost every day for 17 years, documenting it through sketches that form a record of the rocks and the water, the bolts on the deck’s timber and the swimmers themselves — men with big tummies, girls sitting on their towels and kids diving into the water from the rocks. On one visit he swam over a Port Jackson shark that had washed into the pool at high tide. To avoid pumping and filtering, the pool was deliberately carved below the high-tide line, the swallowing of the pool by the sea flushing it twice daily. This natural filtration system means the shallow sea floor is home to resident fish, a reclusive octopus, and enough sea urchins to merit packing a set of tweezers with your togs. Wylie’s is a remedy to the sensory deprivation of lap swimming; the repetitive efficiency of following lines and trying not to get kicked in the side by someone doing breast stroke. You are so entertained by the bottom of the pool that you don’t anticipate the end of your lap. There is no counting of metres (46 if you’re wondering) or halfway point. This is freestyle in the true sense: no lane ropes, no order, just the scraping of your knuckles on the bottom of the pool to remind you how low the tide is. It represents the Australian idea of living with the ocean, rather than trying to control it. An important part of swimming morning laps is the reward at the end of it. So if you’re not perched high at the cafe at Wylie’s, take a stroll further south into Coogee proper to this much-loved local cafe. Coffee is Single O, bread is Iggy’s, and their selection of cakes is hard to resist. The bacon and egg roll with caramelised onion and house espresso barbecue sauce is the perfect antidote to a swimmer’s hunger. Just next door to Wylie’s and tucked neatly into the cliffs overlooking the Pacific is McIvers Baths, the last women’s-only seawater pool in Australia. Throw a coin into the donation basket and follow the cream-coloured balustrade as it leads you down the hill to the sunlit pool below. Since 1876, ladies have swum laps and read books here with the company of others, giving women of all swimming abilities a safe way to experience the ocean. This casual, French-style eatery is known for its croissants, croque monsieurs and baguettes by day, but also serves dinner four nights week. It’s the kind of neighbourhood spot where you can stop straight after a swim for steak frites, coq au vin or a bowl of mussels when you can’t be bothered to cook. Bonus: you can BYO wine. Apr 2 Is the Cross nailed?